Welcome to "Moonlight Serenade" here you will find everything you need to relax and have a fabulous getaway! This home is great for entertaining with its large open concept main floor. You won’t miss out on any time with your guests as they can sit at the large kitchen island while you cook or mix drinks. If the weather is nice you can pull up a comfy chair around the fire pit and enjoy your beverage while dinner is grilling on the propane BBQ. If it’s too cold for that just turn on the convenient propane stove in the living room and switch that margarita for a hot toddy! The highlight of your stay will most likely be gazing at the stars while the gentle breeze serenades you from the extremely private hot tub. If you have a canine member of the family this house comes complete with a dog bed and a large outdoor kennel! There is an air conditioning portable unit in the loft area to keep you comfortable when it's warm. This will surely be the home you want to return to year after year! Love Leavenworth Vacation Rentals is a professional Property Management Company dedicated to providing quality homes and assisting travelers with any vacation needs. LLVR is locally owned, office & field staff live, work & play in & around Leavenworth. We are happy to share our local knowledge & can quickly assist you during stays. We at Love Leavenworth respect that your time with friends & family is a valuable commodity. Our goal is to make your stay as enjoyable & worry-free as we can. We offer affordable quality by providing a variety of clean and well maintained homes, a wide range of pricing options, easy reservations process and professional friendly staff all add up to a great value. The owners of this home have created a fun and comfortable environment to explore and relax in. Small neighborhood in forest setting. Air conditioning portable unit in loft area. Lots of room to roam though no formal lawn area. 3 stairs to enter the home. Majority of living space on main floor. We had an amazing stay. The hosts had everything from a stocked pantry to dog harnesses and treats. The place was so cute and only 15 min from Leavenworth. Thank you so much for a fun cozy weekend! We are so happy to hear that you had a great stay! Thank you for being such wonderful guests. We hope to see you for your next Leavenworth adventure and hope you have a great Spring! This was a beautiful home. My wife and I celebrated our 25th anniversary and my daughter and son-in-law celebrated their 1 year anniversary. We loved the location with access to a wonderful restaurant (The Squirrel Tree), a convenient store for something quick, and a cute coffee stand, Little Reds, right at the end of our road! We found it hard to spend much time in Leavenworth as we were so in love with the cabin and the area. We were able to bring our two pups with us, black and chocolate labs, and they loved the home as much as we did. We will definitely be returning. Thank you! What a great thing to hear and we are so happy that you loved the home so much! We agree that it is a wonderful house in a perfect location. We would love to see you again and you are welcome back anytime! Very nice! Convenient for skiing at Stevens Pass! I had a great time. The fireplace was broken and the space heater was not adequate the first night with temperatures in the single digits. One call and a better space heater was provided. I thoroughly enjoyed my time. A great place to stay! I used the grill outside and the washing machine/dryer. The hot tub looked great but I didn’t have a chance to use it! I would definitely stay here again and would recommend a stay here to others! Thank You! The cabin was awesome, we had a great time. The hot tub was great in the evenings, and there was snow!! We used the sleds provided, and had such fun sledding down the driveway. Also, best stocked pantry I have ever seen in a cabin. Excellent, we would return! 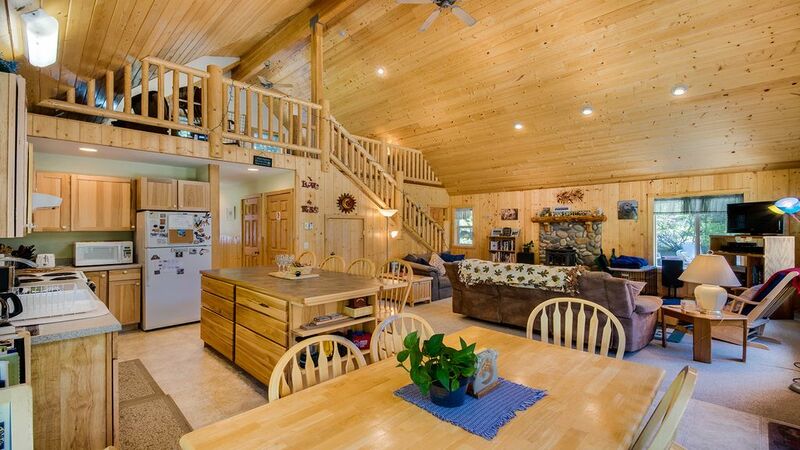 Clean, spacious cabin, perfect for a get together with friends! Well stocked with everything you could need. We're so glad you enjoyed your stay at "Moonlight Serenade" and look forward to assisting you with lodging on your next Leavenworth adventure in this or any of our managed homes. A great big thank you from the entire team at Love Leavenworth Vacation Rentals! NOTE: Love Leavenworth Vacation Rental policy requires that we obtain a LLVR signed rental agreement. We will contact the traveler booking through VRBO within 48 hours of initial payment. NOTE: The VRBO "Book Now" feature is a wonderful tool but in rare occurrences can conflict with other listing site's instant booking services. If a conflict occurs LLVR will be in contact to reschedule or cancel reservation within 48 hours of original booking.